Oceanside, CA (PRWEB) June 24, 2010 -- Your heart beats true for the red, white and blue and your child’s heart pumps for My Pillow Pets® plush folding stuffed animals. 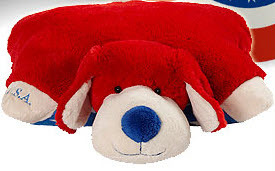 This Fourth of July, honor those who serve your country and your child with the purchase of a special, limited edition My Pillow Pets® plush folding stuffed animal with $5.00 of the cost donated to Scholarships for Military Children, an organization that provides scholarships to the children of military personnel. For more information about My Pillow Pets® plush folding stuffed animals, please visit www.GetPillowPets.com. Since 2003, My Pillow Pets® plush folding stuffed animals have been bringing smiles to the faces of all ages. The concept for the snuggly companions was the brainchild of a San Diego-based mother of two, who had grown tired of picking up stuffed animals strewn across her children’s rooms. What began with the simple goal of transforming a simple stuffed animal into a functional item for children has grown into an amazing jungle of popular retail and wholesale products. For more information, please visit www.GetPillowPets.com. *Stay tuned for my upcoming review and giveaway.